David Hodges is a founding partner of Kennedy Hodges. He focuses his practice on personal injury claims. Washington, DC law is notoriously strict in its stance on car accident fault and one’s ability to pursue a personal injury case. The district follows what is known as contributory fault. This rule is particularly harsh and prevents an injured person from suing an at-fault party if the victim shares any amount of blame for an accident—no matter how small. The rules are about to change, however, for cyclists and pedestrians who are hurt by negligent vehicle drivers. Lawmakers in DC have recently passed the Motor Vehicle Collision Recovery Act of 2016, which gives more leeway for accident victims to pursue damages and compensation. What Is the Motor Vehicle Collision Recovery Act of 2016? DC recently launched a Street Smart safety campaign to bring further awareness to pedestrian and cyclist safety. According to the DC Department of Transportation, there were 75 deaths of those on foot or cycles in 2015. Over the last five years, there have been an average of 987 crashes involving pedestrians and cyclists. In the past, it was exceedingly difficult for the victims of these crashes to pursue legal action against vehicle drivers because of the strict negligence rules. What Kinds of Compensation Can I Pursue for My Injuries in DC? This new law expands the rights of pedestrian and cyclist victims, allowing them to ensure they can receive the important medical care they need and maintain financial security if they are forced to miss work due to injuries related to the accident. 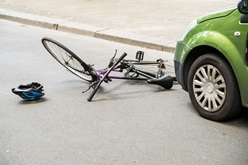 If you or someone you love has suffered injuries while on foot or on bicycle due to a careless driver, you may now have even more right to file a claim. Call the experienced injury attorneys at Kennedy Hodges, LLP at 855-947-0707 to learn more about your options and schedule a free, no-obligation consultation.